Degree Mills: Bringing down Singapore’s Accredited Education System? 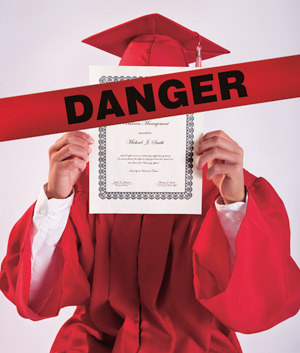 There has been a recent online discussion about fake degrees and degrees from degree mills. Some of you, like me, may have never heard of the term ‘degree mill’ before this. This may be because with the education standard in Singapore, citizens have easy access to legitimate institutions, and may have never heard of fraud institutions before. However, many may have come to know of this term now, because Singapore has been placed on a degree mill watch-list compiled by Oregon’s Office of Degree Authorisation (ODA). Wait, isn’t Singapore the well-known centre providing quality education? How did this happen? I was surprised to find out that there are a total of six institutions in Singapore offering unaccredited qualifications: Vancouver University Worldwide, Lee Community College, Cranstone University, Westmore University, Trident University of Technology and Templeton University. So what exactly is a degree mill? A degree mill is an institution which provides a illegitimate certification and qualification for a person, with a fee. They work in different ways, where sometimes people attend lessons and ‘study’ in the institutions without even knowing that the lessons and degree are inauthentic. Some people however, just pay a certain amount to get a certificate. Knowing that there are indeed degree mills in Singapore is very worrying for the companies in Singapore, as they will be overpaying an under-qualified employee. It is also very unfair for the rest of the population looking for employment with a valid qualification they worked hard for. With so much talk on degree mills today, let’s see what our Ministry of Manpower has to say about this. In all honesty, the Singapore law cannot prosecute people with a degree obtained from a degree mill because it’s not forged, and in some situations they themselves may not even know that it’s fake. As a ministry, MOM’s stand is clear that it will disregard such degrees, and focus instead on other qualifications and experience. As for forged degrees, things are very clear; dishonesty will not be tolerated and these people will be barred for life. MOM has released this cartoon as a visual guide to knowing the difference between the different certificates. MOM does not recognize degree from degree mills. Thus buying degree from degree mills will not be useful at all and will only be a waste of money, and you will not get a better chance to obtain a work pass. Furthermore, if employers are keen to employ a worker with a degree from a degree mill, the worker will be subjected to a more stringent test to ensure that they’re of suitable calibre. MOM will conduct frequent checks to make sure the employer is not cheated by workers. The info graph above will answer most of your general questions; if not please head over to http://www.mom.gov.sg/contact-us to find out how you can contact MOM. As for me, I’m sincerely hoping that the degree mills in Singapore will be shut down soon, so as to not further exacerbate the situation, and to maintain Singapore’s reputation of a top grade education system.